NOTE:- Any testinside updates will be mailed to the contributors as usual. so how i get testinside 247Q's dumpz,,they are closed..carrercert kindly send me these dumpz on my mail id ([email protected])i m be very thankful to you. before few days back there was a contribution link for P4S 642-901 , Is it removed or any update on this , thanks in advance !!! It is just a date change. Testinside is not updated. No. testinside doesn't have explanations. does the testinside answers have explanations ? I have already mailed them several times. Don't know why they are not updating it. why don't you mark mail to testinside for updation of dump ! Yes, the testinside dumps are not updated. A guy mailed me that he failed using testinside. He said there was a new lab and some other new questions in the exam. So i decided to do a group buy for pass4sure. BTW it is not necessary that you'll also fail using Ti. Another guy mailed me that he passed using testinside 7.15. He also reported that there was a new lab in the exam. He solved the lab. So it is a matter of good study skills. If you have prepared well then you can pass with Ti. If you have some doubt about your study then go for latest P4S. I want to give exam within next 10 days, so testinside V 7.15 is more enough to pass the exam ? Please don't fully rely on testinside. Some questions and labs has been changed in the BSCI exam but testinside is not updating the dump. So i have decided to do a group buy for latest pass4sure. It will be ready by April16 or 17.
do you provide the latest version and with $10, will i get the explanations? any difference with paying to testinside? I do check on daily basis. There isn't any new update. any one tell me which is the latest one Testinside dumps. hi wats de latest 642812 dumps version nd hw many Qs in it ???? Anyone passed the BSCI in April, 2010.
if so Please share whether it's new dump or existing one ! You will get the latest version available on the testinside's website. yes, the 642-901 testinside 247qs is the latest. I haven't tried passguide so i can't say anything about it. 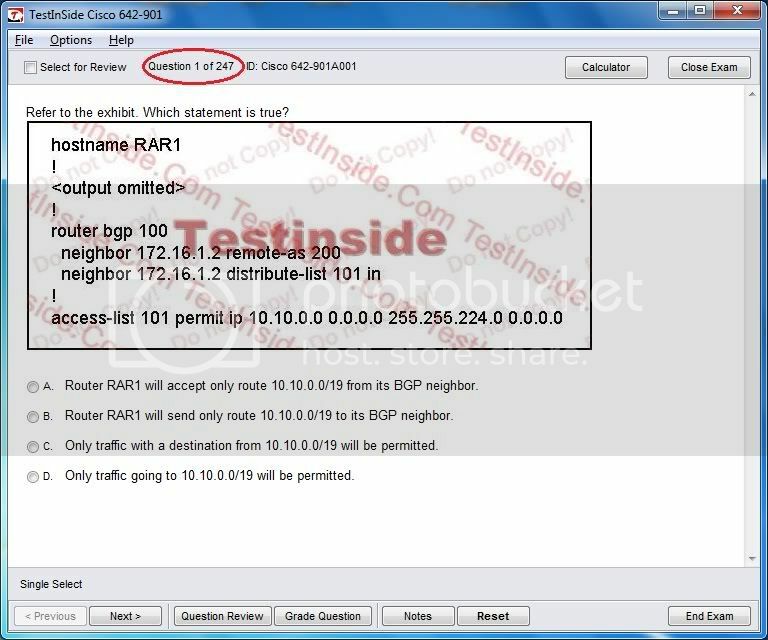 could you tell me if the 642-901 testinside 247qs you are providing is the latest?..is the passguide a reliable source to learn from ? Dear, I understand but $10 amount is very less as compared to $150 exam fee. If someone can pay exam fee then he can also spend $10 at this. There is no update. This one is the latest. I downloaded this content on February 15th is this information still accurate or has there been an update? I plan to test within the next few weeks. No, testinside doesn't contain explanations. Dear, you should not post the transaction IDs online. is there any explanation given for the questions in testinside v7.15? That's great ! Congrats Dear !! Jeremy's CBT nuggets, Authorised self study guide,Digitaltut, Testinside v 7.15. Cisco is going to release new exams within a month. So there will be no change in the CCNP v5 dumps from now on. Believe no change in the dumbs…???? I will send the updates on the same day of release at your email ID, thru which you'll have made payment. how will we get the updates for TI [in case that are any]? I will provide the updates till march. I'm planning to take the BSCI examination on 5 february. If I buy this now is it possible for me to get an update question from Testinside just incase in February it launch a more updated one. These days testinside is more reliable than p4s. Also the new bsci p4s contains 470 questions. Probably that's why you are not able to match them. So do not compare them. Testinside is more close to the actual format. Some exam questions are meant to surprise you. They do not appear in the course material. I just payed for TI GB4 [and ofcourse receive it].